So which one is best? This is not a compare and contrast. That has been done a thousand times. No need to dig deep into the common talking points as this article is not a primer… It’s a collection of thoughts that look into each system and why you should choose one over the other. You got kids? Get to the range once in a blue moon? Compete? Or are you single with a disposable income and plenty of time to hit up courses and shoot? The practical aspects of life should also drive your gear selection. Me? I am the former. With a growing family I have less time to shoot, less time to compete, and have to consider gear in a different way. If your time is precious, a fixed BDC system may be the best option for you. Having a bullet and reticle matched system makes sense if you don’t have lots of time for the deeper learning curve of the mil system. A good BDC reticle will have several tools on board to allow you to range, hold for wind, and to match your drop. Are they perfect? No, they are limited… but in some cases so is our time. Having the ability to pick up a rifle after months and hit targets from 0-700 yards with a single load / optic is no joke… but do the limitations of BDC impair the rifleman? Naysayers will come up with some very good counter-points. The mil-dot optic and variants are like a toolbox for the shooter. The ability to semi-precisely range a target, and then dial in the drop and wind drastically increase hit probability. At extended distance, range error calculation and wind calls are the biggest variables a shooter must solve. It’s absolutely true, if you can keep up proficiency with the mil-dot system, then you have many advantages over a BDC rifleman as far as first round hit. Add a range finder and up goes your percentage. Add a kestrel and up goes your percentage. Add a… Wait. Do you see where I am going here? Does a rifleman really have time for that? The perfect example of a rifleman in practice would be my relative Chris Hernandez. You can read his stories on his own blog at www.chrishernandezauthor.com and if you dig deep enough you can find his experience with the DMR to be a bit eye-opening. Second thing: For most modern combat, 300 meters is plenty far. I carried an M14EBR (Enhanced Battle Rifle) in Afghanistan, and I could consistently hit a torso-sized rock at 900 meters – at the range, with perfect weather conditions, a good firing position, on a stationary target at a known distance. In combat, with extreme heat or cold, unknown distances, hasty firing positions, adrenaline and moving targets, plus little annoyances like incoming fire, I would have been ecstatic to smoke a mofo at 200 meters. – Chris H.
I must have quizzed good old Chris on his experience with the DMR a thousand times by now. 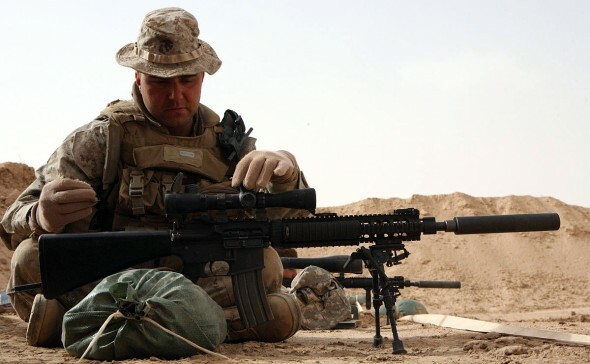 The training he received with a M16A4 + RCO stateside and his experience of carrying a M14 EBR overseas lead me to understand the apparent futility of dialing dope or accurate ranging in combat. Chris had a very capable rifle, excellent training, and he was unable to use the extended capabilities the .308 offered due to the nature of his combat experience. A shifty enemy… moving, hiding, and presenting themselves for a short period of time at unknown distances removed the utility of his Leupold Mil-Dot scope and his traditional marksmanship training. The Marines Still Choose to Rock a Mil-Dot on their German Made DMR. Of course they do. So while the mil-dot gives you more tools and more potential for precision fire, it also requires you to take more time to set up your position, range, and fire upon said target. It requires more training to maintain proficiency. It’s a Swiss army knife, but many of the tools stay folded during the chaos of combat. Ergo, I believe that fast, though imperfect, ranging from a BDC style optic is more than adequate for a rifleman. It removes SOME range error from your shooting, and that may be enough to ensure speed on target and increase your chance of a hit. Couple a good BDC optic with a 20 inch gun and you will reduce the penalty from range estimation error even further. Remember, velocity soaks up ranging error by having a flatter trajectory. If you had a laser gun all ranging error would be eliminated. So with range/training time and real world practicality as our litmus test, I would say most shooters would be better suited for a fixed BDC optic and training with a common, easy to procure projectile. Your limitations in load selection are a bummer, but proficiency with one basic platform supersedes inefficiency with the tools you have not mastered. You can reload for a BDC, you just have to do a lot more experimenting. Optics with multiple BDC tools etched into the reticle are ideal. They offer more than one way to quickly make range calls, some assist with holds for wind, and they still offer speed and utility. Right now I have my eye on a 4x ACSS ACOG. It has several tools to range, is set up for common ammunition (62 grain M855 from a 20 inch gun) and has wind holds. I find many ACOG reticles to be too small and hard to find in adverse lighting conditions, but that’s just another compromise against the other excellent features: a BDC with wind holds brings value back to the table. Mil-dots have their place, and hunters may find them to be the proper tool for stalking and taking game at extended distances. A grazing animal removes the “return fire” variable and permits a bit more time to set up a shot vs someone who’s trying *not* to get shot. So your perceived use defines the value of one system over the other. Right now I am working towards my goal of assembling my DMR/Competition rifle. I will be utilizing irons until I can afford to equip the ACSS ACOG. The reticle looks a little small and easily lost in dark to light shooting conditions, but compromises have to be made with every optic system. The argument of which is better Mil vs BDC can be settled with the following question: how much time and money do you have to master one over the other? I would rather range and fire upon a distant target with semi-precise ranging then wait for the opportunity to precisely range and fire upon a target and never get to take the shot. Familiarize yourself with both tools, but objectively examine your situation and choose the one that will make you a more effective rifleman. Another home run, sir! Thank you for an excellent write up. I always look forward to reading your new material. Experimenting with optics can be very costly in terms of both money and time (learning to use the full capabilities of the glass). This posting helped to simplify & narrow a potential purchase decision greatly. Im glad to be of service! I have spent tons on optics over the years. I have also experimented a little too much, but I can partially blame the blog! Without new gear sometimes this blog might not be very interesting! Good write up. Would the purchase of 4X ACOG have diminishing returns for those of us with aging eyes? Was under the impression that the Tritium found in the ACOG enhanced low light shooting. Leaning towards selling the A2 upper to help fund an ACOG on the A4. Is better for this old man to run a variable 1-4 or 1-6? Hi Jerry. I also use corrective lenses and the ACOG is dependant on your visual quality. You cannot adjust the focus of thr optic / the rear objectice. Ergo, so long as you have up to date RX it should be OK. The biggest problem with many of 4x optics is that the stadia markings ARE hard to see. Going with a 6x variable will make the drop data a bit bigger in the optic and may be a better option but with a weight penalty. You can also adjust them to keep everything sharp if your eyes need another RX trip. I have several ACOGs. I find them a very durable optic. With my imperfect eyesight I have corrective lenses and can use my ACOGs which DO NOT have ocular focus capability. What I primarily use on my often fired AR-malites are low power, variable riflescopes. Variable scopes all can be focused. ACOGs cannot. My suggestion for you is to consider Trijicon’s 1-4x Accupoint (TR24) or their 1-6x version (TR25), second focal plane scopes. The reticle I use in both is their combat oriented Chevron on a post. I prefer the amber color. Either optic will cost you less money than their ACOG. If money is available then you can have your cake and eat it too with the Nightforce NX8. This is their latest 1-8x variable in first focal plane configuration. It has a lighted reticle that at 1x acts like a brilliant, red dot. It is Aimpoint bright ! It is only 8.75″ long. Weighs 17 ounces without mount and has 3.75″ of eye relief. Consider it a red dot sight with 8x capability. My suggestion is to get a quality, lightweight, low power variable where you can adjust the focus. Good luck on your decision. Great post and informative as always. Similar to Jerry’s question, you mentioned you’re back to irons, have you sold off all your variables and going back to the ACOG? Variables are still in my inventory, but this build, with its HBAR barrel, has me looking at lighter weight options that are still legal for Highpower competition. The 4X acss seems to be the best choice for legality and usefullness outside of High Power. The BDV being set for 62 grain bullets makes reloading cheaper too since I can buy far more 62 grainers than 75HPBT match for the same price. Variables biggest issue for me was weight. If I build a lighter weight rifle or carbine, i am happy to keep variables equipped. So, you’re going with the ACOG to keep high-power-legal and reduce weight. Why are you going with a heavy barrel? Its not made to be a lightweight build, but I would rather avoid adding extra weight on top of the HBAR. I was just thinking that taking weight in the HBAR and making up for it with an ACOG wouldn’t be my first choice. I’d take a heavier, more capable optic paired with a lighter barrel. me too, I would opt for different optics and a bit lighter barrel. Good article! I think a lot of it comes down to intended purposes. There is immense satisfaction in landing that hit at long range with the mil reticle, and there is a good reason to have the capability. But there is also a lot to be said for speed and field of view. I did a training course last year that required searching through terrain quickly to locate targets, I appreciated the clarity and FOV of the ACOG. The BDC was quick enough to land hits, especially inside 300m. If you go the ACOG route, definitely look for the LED models. I think they have the most versatility. I am considering all options but still leaning to the ACSS as a general plan for my rifle. Cranking up the light to make use of thr ACOG in adverse lighting conditions is attractive! I just found your blog articles and love the spirited and interesting information you provide. In the spirit of this article, I recently came across Sig Sauer’s new product called “BDX”, which is a 3-faceted approach to hunting, that, via Bluetooth, incorporates (1) a Sig BDX bluetooth laser range finder, (2) a Sig BDX bluetooth rifle scope, and (3) a Sig BDX app running on one’s Android or IOS mobile phone via Bluetooth linking up the BDX Bluetooth laser range finder and the BDX Bluetooth rifle scope. Details can be found by searching “BDX” at http://www.sigsauer.com. The marketing gimmick here is that the Bluetooth laser range finder and the BDX app will perform all the 6 “sniper” calculations in conjunction with holding the Bluetooth riflescope “on target” and will result in illuminating a red dot in your optic where to aim your rifle to hit the target. Basically, it’s a$1500 package to take the “math” and “the guesswork” out of hunting. Currently, I run a manual Sig laser range finder in conjunction with Leupold gold ring 4-14×50 VX3i scopes on my .270 and my .308. And my wife and I are each VERY HAPPY with our current hunting setup. 1. Can you please review the Sig BDX product/platform and give us your independent appraisal of whether it’s a decent and worthy and product which is worth the extra financial investment? (One would have to buy a new Sig Bluetooth BDX laser range finder AND a new Sig BDX rifle scope; the Sig BDX app is free on Google Play Store and the IOS App Store). 2. Is this (the Sig BDX platform) the wave of the future as will this be how my kids and their kids will “learn” the craft of hunting (akin to plug and play in a video game?) Or should we still teach these youngsters the old-fashioned way we were taught to hunt: by tracking, sitting in deer stands, sighting and zeroing in our our scopes, and pulling the trigger, like the thousands of hunters before us? if i could only grasp mil dot math. There is a short cut but i could never grasp it. John, have you checked out the mil dot master? It’s like a slide rule for quickly figuring out mil dot math. A separate ballistic computer is still going to be faster, but the card works well. A DMR is not a Sniper .. so .. very different set-up and training. I run DMR set-ups in 556 & 308 AR platforms. I need quick ranging and close-enough precision on moving and non-moving targets out to 400m. I’ve settled on the ACSS reticles for this task. Lots of choices from ACOG to variables. All have pros & cons. Act accordingly. Does that mean other reticles are not a good choice? Nope. Proficiency and training is the key. In a world where I don’t get as much trigger time or I’m training a Novice to DMR quickly .. then the ACSS reticle is a great tool and has become my go to reticle for DMR applications. I prefer low(er) power variables .. but if weight is an issue go ACOG 4x .. because weight is the enemy. A lightweight rifle that can make hits at unknown ranges at will within 600m is the right choice for a DMR. CONCLUSION: The tools of a sniper are not going to work well in a DMR rapid shoot environment. They are two different animals. Can you make do with one tool for both rolls? Yep .. but why should you? If you really want to be a sniper .. pick what everyone else is running .. heavy .. time consuming firing solutions .. training intensive platforms. My 20″ lightweight 4x ACSS 556 platform weighed in at less than 6.0 pounds loaded. Yes it’s a pencil(ish) gunner profile .. but matched with that optic it’s a well matched set-up .. and due to weight .. is my preffered field weapon. ← The BCM QRF Review: Can Quadrails Still Rock?